Inspired – that is one word to describe Antonio Tardi. His enthusiasm with the culinary arts began at the tender age of sixteen, when his father Giuseppe encouraged him to explore the world of gastronomy. In pursuit of his dream, he completed university studies in his native Naples, Italy at the Luigi de Medici Institute and has since enjoyed a career that has taken him across Europe, the Americas, and in Asia. 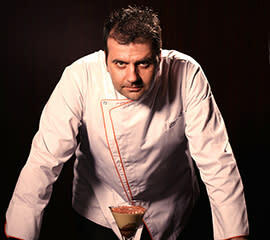 In the early days, Antonio had the privilege of developing his skills under some of Western Europe’s most famed chefs including 3-star Michelin chef, Gualtiero Marchesi in the legendary Grand Hotel Quisisana in Capri; Davide Oldani, at the one-star Michelin Ristorante Giannino in Milan; and Jean-Louis Nomicos, at the one-star Michelin La Grande Cascade in Paris. His expertise encompasses learning gained from these and other exquisite hotels and restaurants in Europe, including the two-star Michelin Ristorante San Domenico in Imola. He has also studied under World Pastry Champion, Luigi Biasetto in Padova, fine-tuning his pastry skills. With a desire to seek new experiences, Antonio later accepted an opportunity with Sandals Resorts International which took him to the Caribbean. While a member of the team, he has had responsibilities ranging from menu planning for food outlets of varying cuisine, to training personnel. Additionally, having played an integral role in the opening of several sister resorts including Sandals Dunn’s River Resort, Sandals Antigua, and the multi-million dollar Italian village at Beaches Turks & Caicos, Antonio can now be considered an expert at hotel openings. After spending time in the Caribbean, Antonio took on a new and exciting challenge for himself. He became a member of the team at the Shangri-la Far Eastern Plaza Hotel in Taipei. With the commencement of this role in Taiwan, he fulfilled one of his life’s goals by working in the Asia-Pacific region. Chef Antonio then headed to Mainland China at the Shangri-la Guangzhou hotel, one of the largest food & beverage operations within the company. There he gained intimate understanding of varying Chinese cuisine, as he helped to lead the culinary brigade. Following his time in China, Antonio was then invited to India as the Executive Chef responsible for all pre-opening and initial operations of the Shangri-la Bengaluru hotel which opened its doors in September 2016. With 11 food outlets of diverse cuisines ranging from popular Eastern palates, to European and American tastes, the position required his expertise in a variety of functions drawing from Chef Antonio’s vast experience. After 7 years of life in Asia, Antonio made the decision to move to North America. He transitioned into western Canada in the city of Calgary, and from there to Vancouver where he has been appointed as the Executive Chef of the Trump International Hotel & Tower® Vancouver. As an avid cyclist, Antonio appreciates the great work-life balance that Vancouver offers, all in the backdrop of this picturesque city where the mountains meet the ocean. As a self-directed and accomplished professional, Chef Antonio continues to seek to use the wealth of knowledge he has acquired in over 20 years in the hospitality industry in innovative and stimulating environments. His philosophy has always been to accentuate and appreciate the natural characteristics found in the products he creates his dishes from, and he continues to do so every day. I can eat gelato all day! What should we know about you that can’t be found on your resume? I am a curious and adventurous person. Olive oil, pasta and Parmesan cheese. What do you think is the next big food trend? Going back to the tradition and the real food, following the season and eating locally. Kitchen quirks – do you have any? My sense of smell. I can find out if a dish needs salt or not, by simply smelling it.